As is probably already apparent to regular readers of this blog, I take rather a visual approach to both understanding things and communicating them. Seldom will I leave a one-on-one meeting without having scrawled on a sheet of paper to explain my train of thought, or to ensure that I have properly understood what someone else has said; equally I tend to be an avid scribbler on flip-charts or wipe-boards during larger gatherings. I was recently engaged in a debate about whether information was a prerequisite to knowledge; unsurprisingly I felt that it was. The discussion took place on the LinkedIn.com Business Improvement, Change Management & Turnaround group and was actually in response to one of my recent articles, “Why Business Intelligence projects fail”. This led to me thinking about the area further and, inevitably to some googling. Of course I appreciate that systems-thinking.org piece is intended to have a broad applicability. However, to me, this schematic pithily captures the fact that Business Intelligence is not just about technology and cannot be effective in isolation. To live and breath it needs to be part of a broader framework covering the questions that its users need to answer, the actions that they take based on these answers and the iterative learning that occurs in the process. In the same way that Natural Selection offers a compelling framework for the phenomenon of Evolution, all-pervasive business intelligence can offer a compelling framework within which an organisation can evolve towards collective wisdom. Of course, in the same way that Evolution does not always imply increased sophistication (just better adaptation to a particular niche), the technological part of business intelligence, in and of itself, does not guarantee an improved organisation. Such an outcome is instead the product of developing an appropriate vision for how the organisation will operate in the future and then working assiduously to get the organisation to embrace this. I have often spoken about the importance of incorporating BI in an organisation’s DNA. The above analogy brings a different dimension to this metaphor. Both the evolution of species and the evolution of organisations are driven by incremental changes to what makes them tick, but also by occasional great leaps forward; a concept known as punctuated equilibrium in Evolutionary Biology. Introduction of good BI can be such a great leap forward, but hopefully without the connotation of Mao Zedong. Returning to the original model, Data and Information may have strong technological elements (though the former certainly has more than the latter, see BI implementations are like icebergs), but Knowledge and Wisdom imply a more human angle; even in these days of automated decision-making with the results of analysis fed back into operational systems. This anthropocentric approach, in turn, raises the profile of cultural transformation in business intelligence programmes; something that my experience teaches me is crucial to their success. These are all themes that I have written about before (e.g. in The confluence of BI and change management), but it is interesting to find a diagram that approaches the area from a different slant. It is also helpful to learn that I am not alone in thinking that information is one of the major pillars of knowledge! I too am a visual thinker and believe communicating in a more visual manner has a far greater impact on an audience. Done right, it filters out all the noise one can get from tons of data. I guess it’s why us humans are still needed. I have had countless conversations recently with customers who think BI is operational reporting. They have oftentimes invested millions in BI technology and thousands of man-hours implementing these reports. They are disappointed when they don’t see the return on their investments and will blame the BI technology and vendor. When we attempt to show them how they will reap benefits with their BI technology, they often respond with fear of change – similar to the caveman seeing fire for the first time. It is a challenge I accept and enjoy to work with my customers to help them evolve from the Neanderthal state into the state of Homo Sapiens Business Intelligenus by turning their operational reporting data into intelligence which can give them the knowledge to make wise decisions. As always, I appreciate your metaphors and insight. Thank you for you comments and your kind words. It is sadly all to common for people to say “we need some reports”, or “we must have a dashboard”, rather than “we need to answer these questions”. or “we need guidance in taking the following decisions”. Thanks for your article and I agree that Business Intelligence needs to be placed in context within a broader frameowrk. However, I have always had a problem with the data, information, knowledge, wisdom hierarchy. I think that this classification is a turn-off to many decision makers and that the source of the problem comes from the ultimate label being wisdom. Replace wisdom with ‘action’ and I think that you get a hierarchy that much better approximates actual needs and the true value-add to data, especially for the BI and knowledge areas. A good point and I have tried to focus on action in this blog (e.g. see “Can You Really Manage What You Measure?” by Neil Raden and some of the articles that it links to). I’m not sure that I would use the D->I->K->W hierarchy in a business context, but it is interesting to see a different perspective. This post reminds me of the Blind Watchmaker by Richard Dawkins. I’ve been thinking along the same lines as you for awhile now and completely agree with the conceptual point your making. I think Mr.Dawkins made the same point in a different context in 1986. Data/Information/Knowledge/Wisdom is an evolutionary journey. 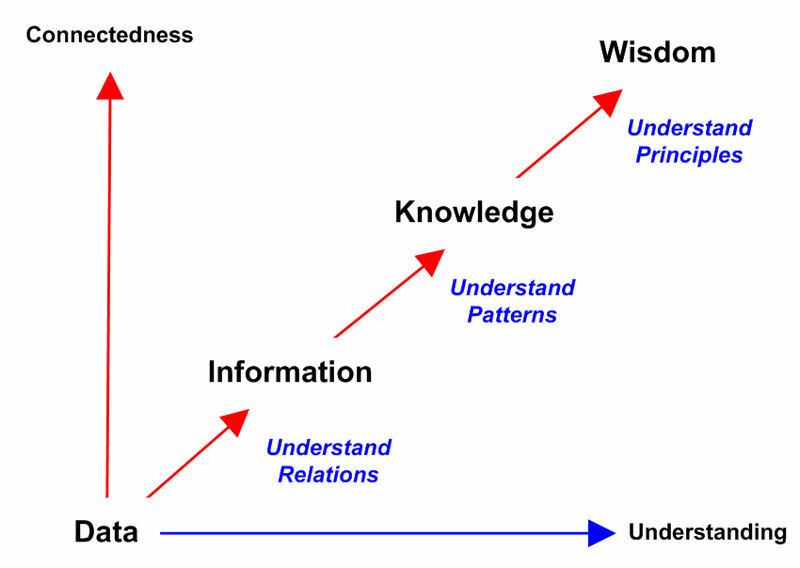 In many companies data never makes it to the Information level…which is the critical part for Knowledge/Wisdom….and adaptation. I’m hopeful that in-memory data visualization tools can bring better insight to more people. I’m also excited about the prospects of (64-bit applications/even lower memory costs) in this area and the larger rapid-viz playing fields that will result. Thanks for the comments Dan. I think this argument identifies some of the troubles with BI implementations. All too often we start with what we have. We don’t take the time to understand what we need first. Secondly, wisdom is not action. I know it is implied, but how many times have we seen people stuck in the “I need more information” cycle – no matter how much they have, they are afraid to act. Lastly, we need to transform the data we need into useful assets. This requires both human interaction and the correct type of tool to present the information required in a digestible manner to the audience. Statisticians and economists can do more with data than executives, yet they often fail in presenting the information to executives. Thanks for your comments, which I agree with. I recently had a debate with someone on LinkedIn.com where they said that starting from a blank piece of paper was a waste of time and money. Given that this is the approach that I have found leads to successful BI, rather than just some nice reports that no one then looks at, I’m glad to see that you see merit in the same approach. If someone tried to put the same spin on the relative value of say, atoms to molecules to amino acids to proteins, I don’t think you’d get the same response. I see a ‘data is a second-class citizen’ attitude all the time, and the people who partake in the bias fail miserably as integrators. The reason, IMHO, is that they make the same classic mistake that most ‘educated’ people make: the little things are somehow less important than the ‘big’ things of which they are a part. One only need examine the silos of intelligence all over today’s enterprises and ask from whence they came and why they can’t easily communicate with other equally intelligent silos to see the proof. The importance of atomic forms, behavior, properties and methods should be on an equal footing to their more complex counterparts. In my view, a hierarchy is the wrong ‘shape’ to describe the nature of their relative worth. PS. Shouldn’t synthesis (as a noun) come after ‘knowledge’? Having spent much of the evening on a primer map for the Absent in Melanoma 2 gene (long story), maybe you have a point with the biological analogy. I guess a number of words could come after ‘knowledge’ I simply repeated the ideas of Bellinger, Castro and Mills.